Line the bottom of a 9 X 9-inch pan (glass or metal) with parchment paper or non-stick foil. Bottom Layer: In a 300° oven, toast coconut and chopped pecans until golden brown and fragrant. Remove from oven and set aside. In the top of a double boiler, melt ½ cup butter and Ghirardelli Ground Chocolate (or cocoa and sugar). Whisk to combine. Whisk in the beaten egg. Whisk until thickened, and then remove at once from heat. Fold in the graham cracker crumbs, coconut, and pecans. Press into prepared pan. Put in refrigerator while you prepare the next layer. Middle Layer: In a large mixing bowl, cream together ½ cup softened butter, half & half, and pudding mix. Fold in the powdered sugar. Beat until very light. Spread evenly on top of the first layer. Cover with plastic wrap. Put in refrigerator again for an hour or so, until middle layer is firm. Top Layer: In a double boiler melt the chocolate chips and Crisco or vegetable oil. The chocolate may melt the middle layer if it’s too hot, so you might want to let it cool for a little bit. Pour onto second layer and spread evenly. Drizzle white or milk chocolate over the top for decoration. * Let set in the refrigerator for 10 to 15 minutes and then cut. (This keeps the chocolate from cracking when you cut it.) Refrigerate for 2 hours before serving. for what 3 tablespoons half & half ? sugar or what else..? 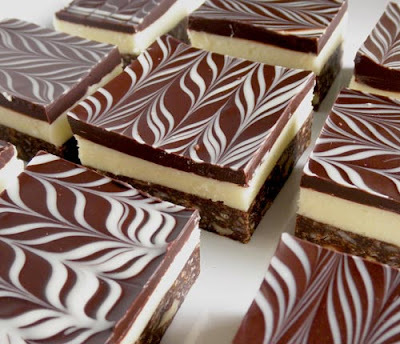 Authentic Nanaimo Bars are made with Custard Powder, not instant pudding mix.